Valentine’s Day is just around the corner. You couldn’t miss it even if you tried. Pink, red, hearts, teddy bears and frilly white objects are everywhere. It is like they were blown confetti, spilling uncontrolled around. Just in time for the love holiday, I had to decorate sugar cookies at work for Allrecipes.com video production team. 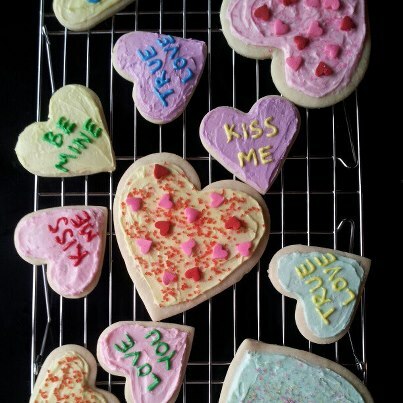 This was one of my first videos taking charge and we baked Pope’s Valentine’s Cookies in various heart sizes. A little bit of colored frosting went over the top and then we went to town writing sweet sayings and decorating with heart and sugar sprinkles. I hope you Valentine is sweet. I will post the video link once it is available.